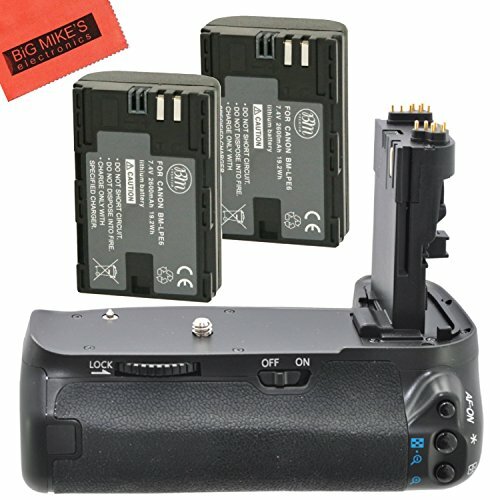 Battery Grip Kit for Canon EOS 60D Digital SLR Camera Includes Qty 2 Replacement LP-E6 Batteries + Vertical Battery Grip + More!! Bring your digital camera back to life with a new battery. Make sure you never miss another once-in-a-lifetime moment by having a new, battery specifically designed for your Canon EOS 60D digital camera. BM Premium rechargeable batteries are engineered to meet or exceed OEM specifications and feature the latest battery technology, including advanced circuitry, voltage regulation, and thermal circuit protection. BM Premium batteries include a one-year warranty. If you have any questions about this product by Big Mike's, contact us by completing and submitting the form below. If you are looking for a specif part number, please include it with your message. Battery Grip Kit for Canon Rebel T2i T3i T4i T5i Digital SLR Camera Includes Qty 2 Replacement LP-E8 Batteries + Vertical Battery Grip + More! !